"The classic chocolate sheet cake with cooked chocolate frosting. It uses a whole can of sweetened condensed milk." Preheat oven to 350 degrees F (175 degrees C). Grease a 10x15 inch jellyroll pan. In small saucepan, melt 1 cup margarine; stir in 1/4 cup cocoa then stir in water. Bring to a boil; remove from heat. In a large bowl, combine flour, brown sugar, baking soda, cinnamon and salt. Beat in cocoa mixture. Stir in 1/3 cup sweetened condensed milk, eggs and vanilla. Pour into prepared pan. Bake in the preheated oven for 15 to 20 minutes, or until cake springs back when lightly touched. 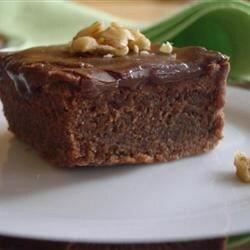 To make the Frosting: In small sauce pan, melt 1/4 cup butter; stir in 1/4 cup cocoa and 3/4 cup sweetened condensed milk. Stir in confectioners' sugar and nuts. Spread on warm cake. the batter is absolutely delicious. make sure to grease the pan with actual grease, not just cooking spray. this is one sticky cake! otherwise delicious. Best frosting made with powdered sugar I've ever had! Wow. Moist, rich, and absolutely delicious. Fast prep. I can't wait for the next holiday or family get-together. I used almond extract instead of vanilla. I also left out the walnuts. Thank you for the recipe.